Many people who think that the only way to get to a particular underground sewage pipe is to dig but will be surprised to learn that with trenchless drain repair, there is no need to dig. We use a special technique to get to and repair and replace underground drain and sewer lines without digging. For people who want to save their existing pipes this is an excellent option. The technique works by lining the inside of your pipe with a hard epoxy resin that hardens in order to form a hard / solid pipe. Your pipe becomes as good as new and there is no need for a replacement, plus we guarantee that there will be no defects. In situations where pertaining is not possible we employ a technique called pipe bursting. The technique works by using a powerful and large bursting head which is pulled right through the pipe and then a new or replacement pipe is pulled in from the rear. The newly inserted pipe does not have joints, but we fully guarantee that you will have no problems, plus there is no reason to dig up your driveway. All our trenchless drain repair techniques are non-invasive so you can be sure that there will be no additional damage and repairs to your property. You will get a complete breakdown of what needs to be repaired prior to starting the job and we will make sure that everything is neat and tidy after the work is complete. 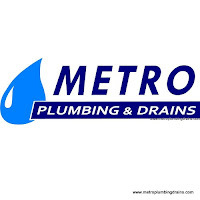 At Metro Plumbing and Drains all of our plumbers have many years of experience with this type of repair and we guarantee that your job will be performed by a professional. We are fully licensed and issued. Call us today for a free estimate for your trenchless drain repair project.